Powder Perfect - The Bermuda Triangle Trio - Polish Etc. Summer has arrived! It has been super hot here and all I want to do it hang out at the pool or beach. (except that I get burnt to a crisp and have to hide under an umbrella) But still...summer is here! Powder Perfect has put together a perfect little trio of bright summer shades inspired by the Bermuda Triangle. It is a little strange, because right now it is winter in Australia which is where Powder Perfect is based. But us Northern Hemisphere folks truly appreciate the warm summer vibes that this trio provides. Let's take a look at these beautiful polishes! Florida - A bright and juicy coral creme. 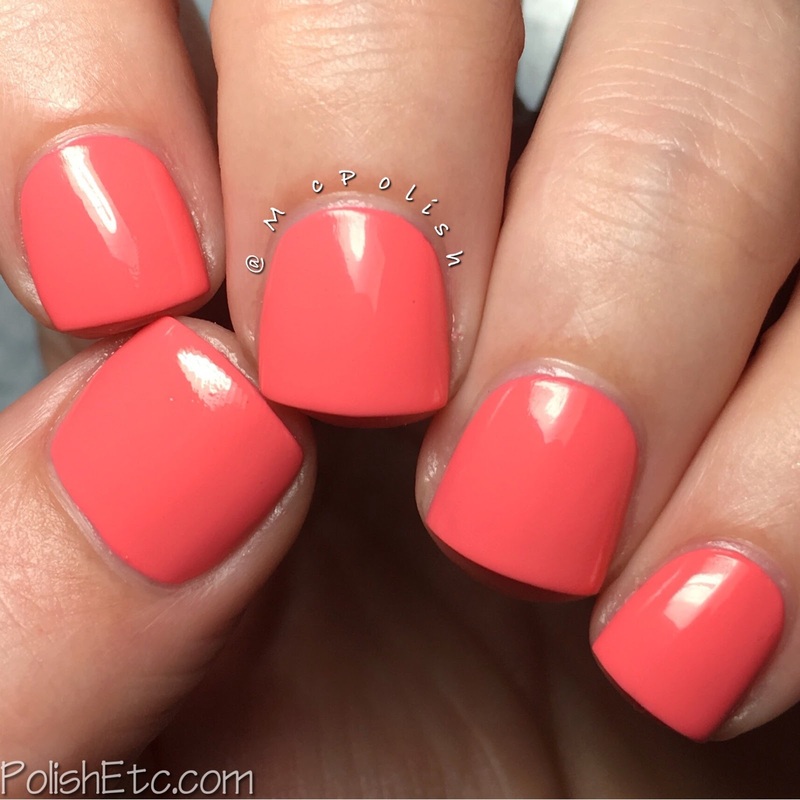 This coral shade is has a little more pink in it which makes it much more girly. The formula is great. It is a little bit thicker but in a good way. I did two easy coats topped with Powder Perfect's quick dry top coat, Lightening Lady. I got several compliments when wearing this color. Puerto Rico - A bright and bold medium purple creme. I love this shade of purple! It is so bright and pretty. The formula was thick but still applied well for me. For this swatch I have two coats on my thumb but only one coat on the rest of the nails. It is all topped off with Lightening Lady. If you don't like thick polishes, you might now love this one but a little bit of thinner would do just fine. I always love a thicker one coater. Bermuda - A bright and saturated teal creme. This shade is sure to be a crowd pleaser. It is the color you would expect to see in the sea around Bermuda. Try not to get lost in it :) I was able to get this completely opaque with just one coat. The formula is on the thicker side but was still easy to work with. I topped it off with Powder Perfect's Lightening Lady. I created this simple dotticure using all three colors in the collection and some dotting tools in differing sizes. I really like how well all of these color go together. They really are great for summer and I am totally digging the formulas. The quick dry top coat is really nice as well. Again, it is thick and glides nicely over the nail.